We believe there is strength in numbers and that collectively we have the power to help other women and girls to live their dreams. As Soroptimists and change agents, you are very much a part of this initiative as we work together to increase our impact and expand our reach! We love and appreciate your support. Powered by Soroptimist, the LiveYourDream.org online community offers an alternative way to deliver our mission; strengthen and grow the Soroptimist brand; and increase resources to improve the lives of women and girls. To engage a new, vibrant community of activists and volunteers with our Soroptimist dream programs. It was a really good experience, something I could do from home that could have a positive impact on somebody’s life. You don’t get to do that every day. Each volunteer decides their involvement level and how they’d like to engage or take action in a number of Soroptimist’s award-winning programs, which includes spreading awareness about causes such as access to education (Live Your Dream Award), empowering girls (Dream It, Be It), and ending violence against women. Currently, LiveYourDream.org is administered in English only and is predominately U.S. based. Follow this guidebook for everything you need to know about LiveYourDream.org and how it can benefit your club as well as the entire organization. 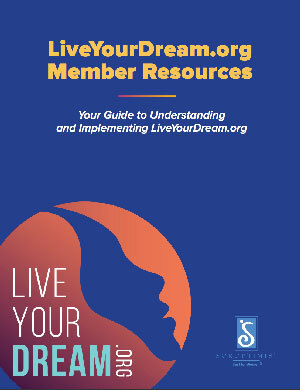 Find FAQs, tips and background info on how LiveYourDream.org is working to advance SIA's mission.